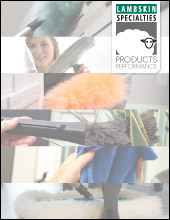 Our collection features a comprehensive line of cleaning products for surfaces from floor to ceiling, inside and out, addressing a broad range of maintenance applications. These products are designed to perform. The catalog focuses on five main areas of maintenance: Everyday Dusting, High and Low Dusting, Floor Care, Window Care, and Auto Care. Each category offers a variety of products, including our best sellers and many new introductions. The final section of the catalog is devoted to our Merchandising Products, designed to increase show room profitability and generate new product sales. And because tomorrow’s maintenance needs are today’s design challenges, Lambskin Specialties will continue to play a leading role in bringing new, innovative and highly effective products to the market. Beyond the scope of our current line, our manufacturing skills and creativity allow us to design and produce customized and specialized products to meet new maintenance requirements. New Products, including Bio Mop, Micro Fiber Clothes, Micro Fiber Carpet Bonnets, and the 347-CB Max are some examples of our commitment to a cleaner, and greener world. We invite you to try these out. Please note that Adobe® Reader® must be installed on your system in order to view our Newsletters. For a free download of the software, please click here.